So, this post contains the last graphs of the season. It will probably also be the last post until next season. It may in fact be the last post, period. After three winters of this experiment, I’m ready to call it a success– and keep living it, but not necessarily keep writing about it. We shall see. First, numbers. Our average (mean) living room / kitchen temperature for the entire winter was 53.4ºF. And, delightfully, the median temperature was exactly the same. And, the mid-point between our highest temp (72.9º) and lowest temp (36.3º) was also almost exactly the same (54.6º). 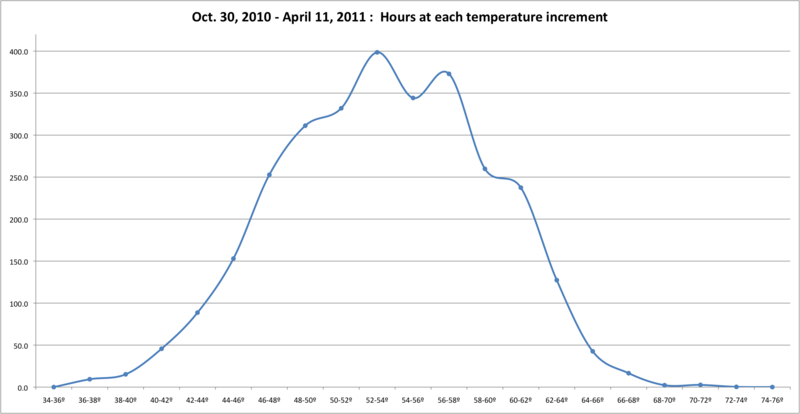 The standard deviation from the mean temp was 5.8º, meaning we spent about 2/3 of our time between roughly 48º and 60º. Overall it’s a nice, near-normal distribution. I’m hard pressed to explain the divot right in the middle, around 54º. The little shoulder on the right side, around 63º, should probably be labelled “we had guests”. And here is a plot of the weekly average temperatures over the course of the winter. There wasn’t really much of a pattern. So, that’s it. Enjoy the summer. Thanks for reading. This entry was posted on April 13, 2011 at 12:39 pm and is filed under Hard data, Uncategorized. You can follow any responses to this entry through the RSS 2.0 feed. You can leave a response, or trackback from your own site. Thanks so much for your wonderful post!!! I am your Kentucky reader – and your living conditions have given me faith that I can live a little cooler in the winter, adapting to the elements. And – for summer – minimal air conditioning. I think it has improved my health, as well as saved money. Have a great summer. And I hope you will continue your post next winter. Thanks for the interesting posts. This was the first winter I came across your site — enjoyed reading! I’m one of your readers from Turboglacier years… I have LOVED your Cold House Journal posts…. even your endeavors to cool down your previous house with white rolls of something on your roof. I also hope you keep going, but will understand if you have run your course. Speaking of which, happy sailing this summer. Drop an email if you are ever in Camden and I’ll cook you(s) suppah.